PVC, technically known as Polyvinyl Chloride is really vinyl roofing, though is routinely referenced as PVC roof. PVC competes with TPO and EPDM in the synthetic roof membrane arena, and indirectly with all other roofing materials including BUR, modified bitumen, and structural standing seam roofs designed for lower sloped roofs. 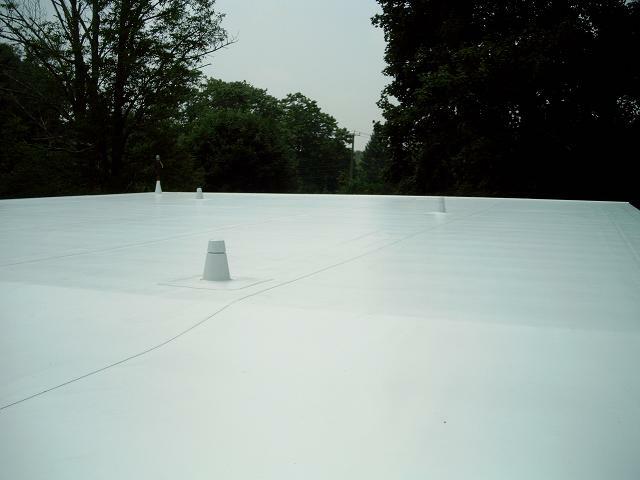 Membrane roofs are usually applied to flat or low-slope roofs, but using a single-ply membrane on a sloped roof is also possible and common on roofs with slopes between 1:12 and 3:12. Why not just use traditional roofing materials (asphalt shingles or other tiles) on a low sloped roofs? Because they are very likely to leak unless a minimum specified slope for shingles or tiles has been met. When used with a slope, the overlap of those materials are designed to shed water away from the roof deck. Whereas flat roofs have only a slight pitch, and any standing, or pooling water, could lead to immediate leaks and rotting soon thereafter. PVC membrane is a kind of roofing material that can withstand pooling or standing water — puddles of water that accumulate on roofs with low slopes. Of the three primary membrane roof types, PVC is the most expensive. EPDM is the least costly option, and TPO is somewhere in the middle. TPO allegedly offers the benefits of both the other types, yet that material keeps undergoing formula changes, and so compared to PVC and EPDM is considered less reliable, particularly when it comes to warranties. Prices for residential installs can vary greatly. A roofer is likely to quote differently than a professional PVC installer, probably less, but also likely to not have the proper tools. A fair range, is between $6.00 and $8.50 per sq. ft. if installed by a PVC expert. On the lower end if going with less thick material. In terms of value, durability and ROI, PVC is arguably the best, or longest lasting of the three. EPDM will go 7 to 15 years before needing replacing or re-coating. TPO is thought to go as long as PVC, but that information is either suspect or unknown for sure just yet. PVC has been in the field for decades and unlike TPO isn’t constantly undergoing changes to the formula to address performance issues. Warranties are usually ‘lifetime’ and with proper installation, it ought to retain solid performance for 20 years or more. PVC material is purchased in rolls that are anywhere from 6 to 12 feet wide. Usually when people first consider PVC roofing they think pipe, but those are not the rolls, nor the exact type of material used for roofing. When unrolled on a roof, it forms a membrane, that is single-ply, and is rather flexible. To obtain flexibility, the material has additives. Over time, these additives can break down due to UV rays, but that usually takes decades (20+ years). Whereas TPO is naturally flexible, PVC is not, but can be engineered to be just as flexible and light as TPO. Between each sheet on the roof are seams, but like TPO, the seams are rectified via air or heat welding. And like TPO, this creates a monolithic roof, that makes it a waterproof barrier on the upper most layer of the home. See this YouTube video as an example of how heat welding works. The weld is one piece of special equipment that a typical roofing contractor may find unnecessary to purchase if only doing a couple such jobs a year. So, they may forgo this process and overlap seams with glue as the way to obtain a tight seal, which leads to less than 20 years of solid performance. Attaching PVC rolls to the roof occurs in one of three ways. Most common is mechanically attaching via special metal plates placed over the membrane (in between the seams — before they are welded together) and secured with manufacturer-approved screws. Second most common installation method is via gluing or what is usually called the fully-adhered method. And finally is the ballasted option where river rocks or ballasts are strategically situated to hold it in place. White is the most common color for vinyl roofing, but not the only. Manufacturers can blend any color in, and thus throughout, the material, so with PVC roofing there are numerous color options. The white and slick surface of PVC makes it fit in with a true cool roof that will reflect a high amount of UV rays, and lead to much cooler roof surface temperatures, and hence significantly less heat transferred indoors on hot summer days. PVC sheets are produced by spreading the vinyl material, which are typically are reinforced with polyester or glass-fiber mats. Overall, PVC membranes will have a thickness between 45 and 80 millimeters. 50 tends to be the norm for residential purpose, but is really a builder preference, or can be made higher by homeowner request and willing to pay for added thickness. PVC roofs have a minimum breaking point of 300 pounds per inch, which makes for above average durability. One caveat — PVC is incompatible with asphalt-based products. If installed anywhere near an asphalt product, a separator sheet must be in place to keep it away from the asphalt. — This is one instance where a TPO membrane would be a more suitable alternative.